Just during the course of the past year, many cranes have emerged and construction is in full swing once again. This, of course, gives enough to start questioning the pace of the new construction happening on the Costa del Sol. A perfect page to find all the needed statistical information on this subject is ine.es – the Spanish National Statistics Institute. The following compact information table for the entire Spain, demonstrates a clear increase, especially since 2015, in both residential and business construction starts. We are talking here of just about 10.000 projects, but only until the month of May 2017. So we are coming close to 2016 again. Great news. As the before mentioned includes all of Spain, how much of this increase goes to Andalusia? In a nutshell, it appears that there is a strong demand from Europe for new construction rather than a demand for re-sales. In Mijas, for example, you will find Buena Vista Hills, a housing project set in a strategic location providing its residents impressive panoramic views of the sea. 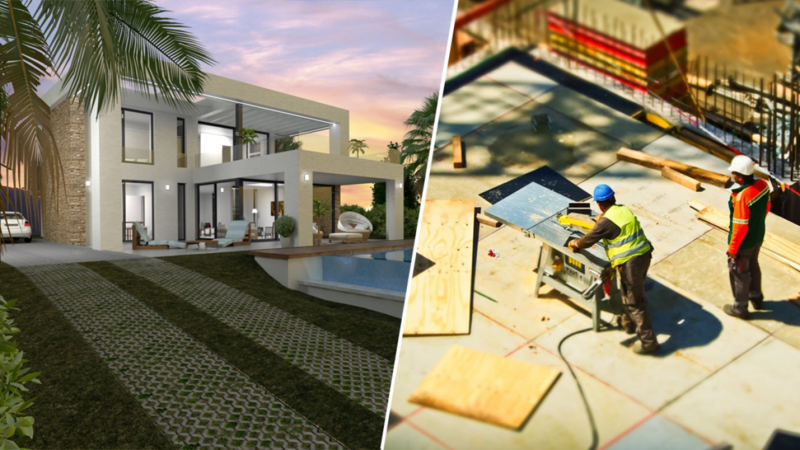 This new 26 villas development will start construction in Autumn 2017 situated on various plots from 500 – 900 sqm with different designs within the modern and open space contemporary villas from 264 – 393 sqm depending on the model and plot. The project is designed to combine a sleek architectural language with a peaceful natural setting surrounded by pine trees and the beautiful mountain of Mijas.